Joe Biden has taken another step toward entering the Presidential race. Representatives of the Vice-President held a meeting this week with Democratic National Committee staffers. They briefed Biden’s aides on arcane but crucial rules that the Vice-President would need to understand if he decides to run, according to a D.N.C. official. It was the most significant sign the source had seen to indicate Biden’s intentions. “I think it means he’s running,” the source said. The D.N.C. has held similar meetings for representatives from the five declared Democratic candidates: Hillary Clinton, Bernie Sanders, Jim Webb, Martin O’Malley, and Lincoln Chafee. The D.N.C. offered the meeting to Biden earlier this year, and the party committee was scheduled to brief his aides back in June, but that meeting was cancelled. I’m not so sure that this is “the most significant sign” to indicate that Biden is thinking of running. Is this really more significant than meetings with fund raisers or looking into starting the framework of a campaign? Biden is hardly new to politics, and I also wonder whether this is isn’t actually information which his staffers hadn’t already researched. 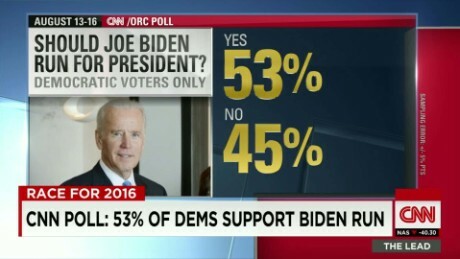 Maybe this is a more significant signs than all the other signs that he is strongly considering running, or maybe it is one more example of how Biden is doing research to prepare for a decision as to whether to run. What I find interesting here is the list. Notice one name is missing. Maybe it was an oversight by the writer, but this suggests that Lawrence Lessig was left out. That would be consistent with Lessig’s complaints that the DNC is trying to keep pollsters from including him, which would result in excluding him from the debates. The vice president’s office declined to comment. In a statement, the super PAC said it would “honor his wishes” and pull the ad.